Calorie for calorie, leafy green vegetables like rocket and watercress with their delicate texture and jade green colour provide more nutrients than any other food. The darker the leaves, the greater the nutrient content. 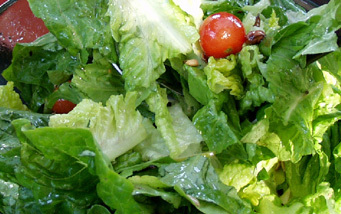 Like other greens, lettuces are very low in calories and contain mostly water, with only a trace of fat. Nonetheless lettuces contain many vital phytochemicals, anti-oxidants, vitamins, and minerals depending on the variety. Rocket for example is a good source of folate. A staggering number of women are not getting enough folate in their diet. Folate is a B Vitamin that has long been known for its role in making new body cells, preventing certain birth defects and a growing body of research suggests a link between folate and heart disease. Some research papers suggest that people with low levels of folate or Vitamin B12 may be at a higher risk of Alzheimer’s disease. My practical nutrition suggestion – Although we tend to think that lettuce is only eaten raw in salads, we can also add them to different soups or even braise them as a side dish. Some food adventurers even mix them with spinach leaves in stir-frys, hovering up those excess leaves in the bottom salad drawer of the fridge or from the garden patch.